I cannot say enough great things about Dave and the service he provided. My boyfriend, now fiancé, bought my ring through Dave and he was incredibly helpful with every step of the process. Integrity is just the beginning, Dave knows what he is doing and stands behind his work whole heartedly. I would recommend Integrity and Dave to anyone who is looking to make a jewelry purchase! "I had used the same jeweler locally here in Medina for years, but when they were sold I just didn't have the confidence in the new ownership as I really didn't know anything about them. I decided to give Dave a try and what a great experience it was. I started out by getting a quote on selling my gold pieces I no longer had any use for. I had gotten a quote from another place of business and it was 1/3rd less than what Integrity Gold was willing to pay me. That's a substantial difference, so glad I gave Dave a try, it truly paid off. You have been great at all of my silly little things too, like cleaning jewelry, putting different clasps on pieces so I can maneuver them better, repairing pieces, etc. I didn't hesitate for a moment when somebody recently asked about engagement rings, and I referred them to you. It was going to be a very expensive piece, and I knew you would serve them well. After he received the engagement ring he took it took a "big box" store and they confirmed that he got one heck of a nice price on it. Way to go Dave, I will refer you any opportunity I get!" Words cannot express how happy we are with our most recent purchase at Integrity Gold Jewelers. Dave has been in the business for many years and continues to provide top-rate customer service and outstanding quality at a great price!!! I was looking for a piece of jewelry for my wife, something different. It was pretty amazing. After talking, Dave texted six pictures of various necklaces he thought might work and there was one that was just the ticket. My wife wore it to work the first day and a number of people commented on its uniqueness and beauty. One coworker wanted one exactly like it for her birthday. Unfortunately, it was one of a kind. Thanks Dave, she loves wearing this. Bottom line is Dave has great service and selection, wonderful prices and is a pleasure to work with. As a side note, we had a lot of gold chains, bracelets and other "junk" that were never going to be used and Dave bought it from us for about double what I thought we could ever realize. Thanks again! Many thanks to Dave for making our engagement memorable and special. We appreciate that he spent time getting to know us, not just treating us like “another customer”. Dave was laid back and patient while we searched for the perfect diamond and was determined to find us happy. He came through providing outstanding quality at a first-rate price! We are looking forward to continuing our relationship with Integrity Gold and working with Dave in the years ahead. “I purchased a ring from Dave with our MK (Mary Kay) initials on it. Dave is authorized by Mary Kay to make these rings and they are really nice. I love mine. Dave gives examplatory service and quality workmanship. I highly recommend his customer service and his personal touch.... thanks Dave I love my ring." I met Dave at Leadership 2011 in Houston. Right away I found him extremely personable and genuinely interested in how he could help me and my promotional needs. It is so refreshing finding someone that not only has quality products at great prices, but also is willing to work with you individually no matter what quantity you are buying. My consultants are so excited about earning his jewelry. I just received the Mk sterling ring with diamonds added- can I just say LOVE IT!!!!!!! So glad I found Integrity Gold Jewelers, and will be using his pieces for many of my up coming promotions. And don't forget to send him your scrap gold, I got top dollar and am very pleased!!!! 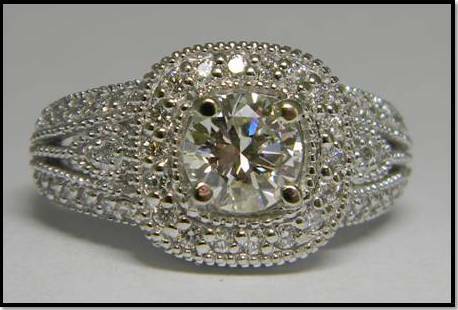 Integrity Jewelers is just that - a high integrity business that delivers great jewelry for a reasonable price. I can't thank you enough for the fast fix of my wife's favorite necklace. The lobster claw clasp made the necklace doubly secure and she finds it easier to use than the old friction clip closure - good suggestion! In fact, she was wearing it today - it was the right color for her blue jeans. Integrity Gold and Dave Gangel made my purchase painless and later stood behind his product and work...I would go back again for sure! I recently purchased an engagement ring from a design I found/modified and Dave helped to turn it from chicken-scratch to reality...and did a great job. He also helped to locate, guide, and select an excellent diamond from his choices (all were great). When an issue arose, no questions asked, he stood behind the ring and made it right (quickly and at no cost). I continue to buy from Integrity Gold (2 more bands for the wedding) and will be doing more when I need. I recently worked with Dave to find and purchase my engagement ring. I'm a Mary Kay Sales Director and I knew he worked with the Add-A-Diamond ring promotions-so I asked him about the ring I was looking for-- He had an A++ reputation for honesty and integrity from several of my MK friends. Dave couldn't have been more friendly and professional-- I sent him my old gold jewelry and he purchased that at a great price as well. I suggest you call him to find out what he can do for you! He gets an A+++++ rating from me and I will call on him with all of my jewelry needs in the future~why go anywhere else?! Uncle D was thrilled to hear that he is getting $575 for the junk jewelry he don't even wear anymore...Thanks Dave! I can attest that you definitely have integrity (no pun intended) in your gold buying Dave. I highly recommend anyone considering selling their gold to see you!